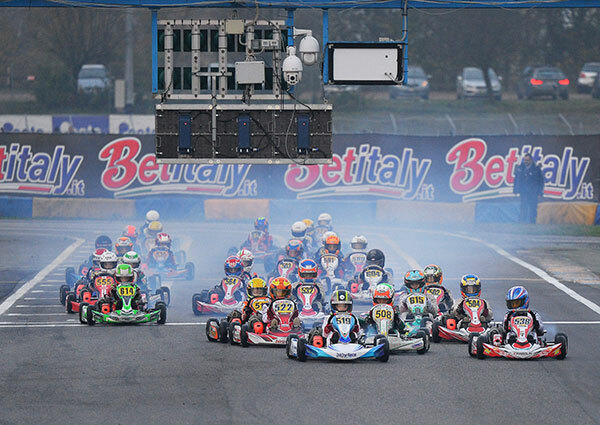 James Wharton (FA Kart/Vortex/Ricky Flynn Motorsport) has qualified 5th in the 56-kart OK-Junior field at the second round of the WSK Final Cup in Italy this weekend. Pole went to Parolin’s Gabriel Mini, almost four tenths faster than anyone else! In Friday’s opening race, Wharton moved up to record a second placing (he’s in group B for the heat races). The remaining heats will be conducted tonight (Australian time) with Finals on Sunday night. On track for the second round of WSK Final Cup in Castelletto. 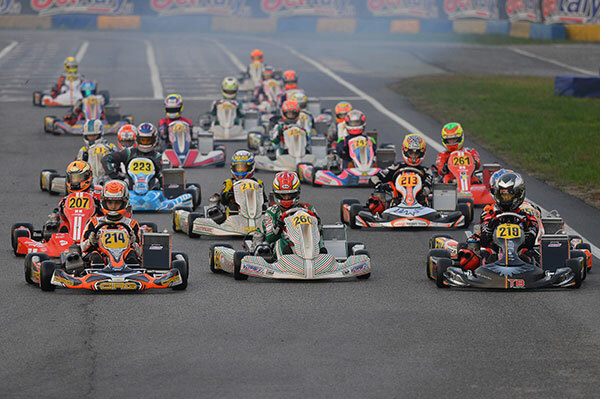 A total of 192 will challenge each other for the points up for grabs in the second round of WSK Final Cup that has just started. 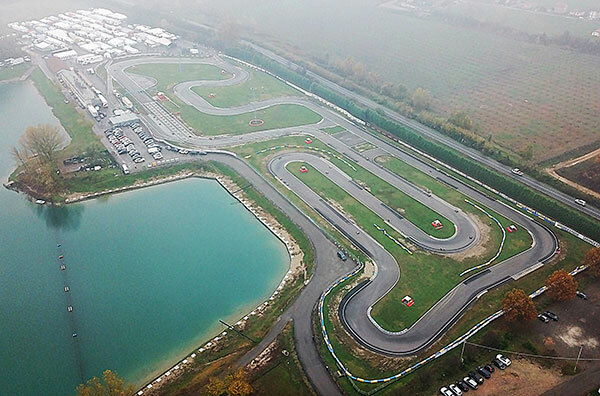 The Settelaghi Kart circuit in Castelletto di Branduzzo (PV) is the theatre of this challenge that has seen constructors, teams and International karting drivers getting the first indications from the track today in qualifying practice. The paddock is once again coloured with flags coming from all over the world and a total of 38 different Countries are represented by several Motorsport champions to be. Among these, some are following the footsteps of their fathers, that were Formula 1 drivers, like Brando Badoer (Parolin-TM-Vega) in 60 Mini, Enzo Trulli (CRG-TM-Vega) and Lorenzo Patrese (KR-Parilla-Vega) in OKJ. Brando Badoer ready to bounce back in 60 Mini. With rain falling on-off, 60 Mini saw Brando Badoer having the upper hand and leading the British driver Coskun Irfan and the Russian Kirill Kutskov (all on Parolin-TM-Vega) with his best time of 1’09”204s. Classification leader from Jamaica Alex Powell (Energy-TM), posted the 7th time in qualifying but then won one of the heats. The other victory went to the Russian Dmitry Matveev (CRG-TM). Badoer will certainly try and attack Powell tomorrow in the heats. On top, the start of one of the heats in the picture by Sport in Photo. Gabriele Minì charging in OK Junior. Gabriele Minì (Parolin-TM-Vega) is resolute to recover in OK Junior and his target is to fill the classification gap: the Italian posted, in fact, the quickest time in qualifying in 1’03”539s, leading the Russian Kirill Smal (Tony Kart-Vortex) by 0”394s and the Italian Andrea Antonelli (KR-Parilla) by 0”412s. The fight for the lead will certainly involve these three drivers, as Smal and Antonelli managed to win the first two heats this evening, while Minì will have to come to the fore in tomorrow’s heats. The battle on top is quite lively in OKJ and classification leader from Britain Taylor Barnard (KR-Parilla) posted today the 9th time in qualifying before ending his heat in 5th place. Lorenzo Travisanutto the quickest in OK. The battle in OK involves Lorenzo Travisanutto (KR-Parilla-Bridgestone), who has been the quickest in Castelletto’s qualifying with a lap time of 1’02”719s, and the Dane Nicklas Nielsen (Praga-Vortex), who ended behind him but ahead of the Brazilian Gabriel Bortoleto (CRG-TM). Nielsen, sixth in the classification behind leader Travisanutto, started well winning one of the heats held today, as did the Swede Viktor Gustafsson (Kosmic-Vortex), who won the second heat (above, the start). Travisanutto was fifth today in the heat won by Nielsen. He was also challenged by his closest rival in the classification, the Dutch Kas Haverkort (CRG-TM), who was second. Adrien Renaudin very fast in KZ2. Adrien Renaudin’s arrival to KZ2 has been quite successful: the French driver was the quickest in 1’01”550s leading the Israeli Ariel Levi (both on SodiKart-TM-Bridgestone) and the Swede Axel Bengtsson (Kosmic-Vortex), before ending the first qualifying heat in second place behind Bengtsson. The French Emilien Denner (KalìKart-TM), who is also expected to play a major role in the fight for the top tomorrow, ended third.